In partnership with the University Libraries, The Writing Place held its first Write Night event of the 2018-2019 academic year yesterday evening from 8pm to midnight. Over 100 students participated in the write-in event, which included pop-up writing and research consultations, planned break activities (including trivia and button making), as well as plentiful coffee and food. The undergraduate peer writing consultants who staffed the event appreciated the opportunities and flexibility the event's format offered both them and the students they helped. "I often get students that want to work with me or find that they need help more than they thought, but unless they schedule well in advance, they'd usually have to wait awhile (or the paper is already due). 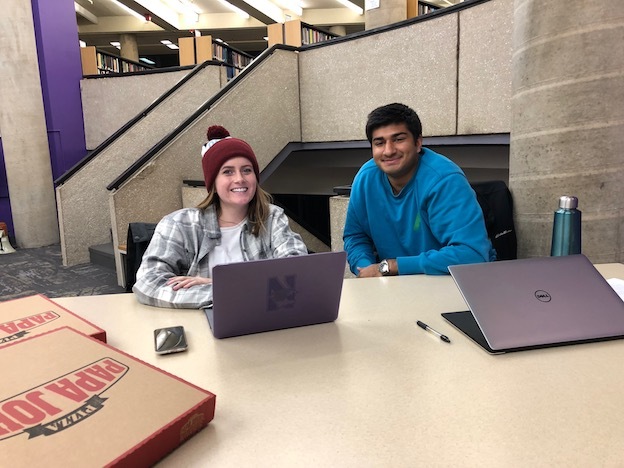 I liked that this event gave everyone a chance to come in and write, and it's especially encouraging for students to work on papers before just the deadline," explained Sayeed Sanchez. At least three more Write Nights are planned for the 2018-2019 school year, with the next scheduled during Weinberg's reading week on December 4.